Achieve solid performance, dependability, and clear voice reproduction with the Electro-Voice RE3-RE420 (Band 6M: 653 to 663 MHz) UHF wireless handheld microphone system. Comprised of a rack-mountable diversity receiver and one handheld wireless transmitter with an RE420 cardioid condenser microphone capsule, this wireless set is well suited for singers, speakers, and presenters in clubs, concert venues, houses of worship, and conference rooms. The RE420 delivers full-bodied vocal tone, reduced ambience, and increased feedback rejection. Thanks to simple operation and the ability to control the transmitter from the receiver, the RE3-RE420 minimizes setup time and maximizes workflow efficiency. Two included AA batteries provide up to eight hours of operating time for the transmitter, which offers adjustable sensitivity and RF output power to optimize your gain structure and avoid clipping. Backlit LCD screens display crucial information such as transmitter battery status, frequency, KeyLock mode, and mute status. Easily sync, scan, and control this wireless system via its dedicated buttons and straightforward menu navigation. The RE3-RX6M Diversity Wireless Receiver from Electro-Voice is a UHF wireless diversity receiver featuring clear frequency scanning, wireless synchronization to transmitter, balanced XLR outputs, and unbalanced 1/4" TRS outputs. 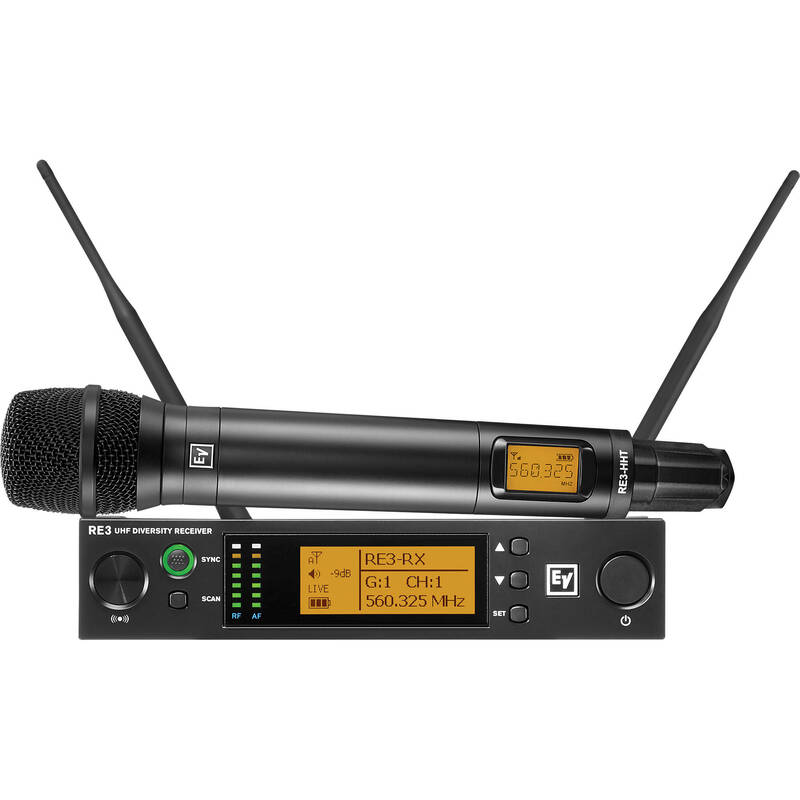 It can be used when paired with any RE3 HHT handheld capsule or bodypack transmitter and microphone (sold separately) to deliver rock-solid system performance for presentation or interview audio applications. The RE3-RX is rack-mountable, and the 1/2 space diversity receiver is designed to function as the control center for your wireless setup. Using clear frequency scan and sync functions, the receiver offers control settings that synchronize to a mated transmitter. Diversity reception technology minimizes the chance of signal dropouts and provides two different antenna locations. The antennas switch moment by moment based on signal strength and stability, which insures solid performance. Additionally, the easy-to-read LCD display provides vivid viewing of all menus and operating parameters. The RE3-HHT4206M UHF Wireless Transmitter with RE420 Condenser Cardioid Capsule from Electro-Voice is a lightweight, yet robust UHF handheld transmitter body with a condenser cardioid microphone head for vocal performance and presentations. It can be used when paired with the RE3-RX diversity receiver (sold separately) to capture audio for all-around voice applications. The handheld transmitter setup is quick and simple using the RE3 clear frequency scan and sync functions. It features 400 selectable frequencies, switchable low- and high-output power, and up to 10 MHz tuning bandwidth. Additionally, recharging contacts provide for functional use with the optional BC2 charging station (sold separately) allowing the NiMH rechargeable cells to be charged without removal from the transmitter.